Scientists have used data from NASA’s Chandra X-ray Observatory and the NSF’s Jansky Very Large Array to determine the likely trigger for the most recent supernova in the Milky Way. They applied a new technique that could have implications for understanding other Type Ia supernovas, a class of stellar explosions that scientists use to determine the expansion rate of the Universe. The new research with archival Chandra and VLA data examines how the expanding supernova remnant G1.0+0.3 interacts with the gas and dust surrounding the explosion. The resulting radio and X-ray emission provide clues as to the cause of the explosion. 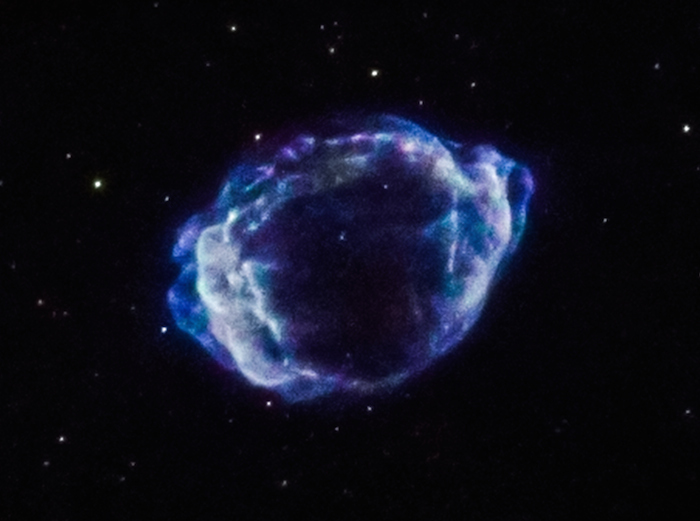 In particular, an increase in X-ray and radio brightness of the supernova remnant with time, according to theoretical work by Chakraborti’s team, is expected only if a white dwarf merger took place.